Khalifa International Stadium ... due for completion this year. Driven by the need to meet its 2022 World Cup commitments and in line with the country’s 2030 Vision development plan, Qatar is pressing ahead with its infrastructure plans, says DHUSHYANTHI RAVI. the world’s most prestigious sporting event. The nation has to spearhead these plans against a backdrop of weak fundamentals such as plummeting oil prices, a shortage of skilled workers and building materials, and rising costs of construction. But press ahead it must – and there have been clear signs that Qatar means business. Already, work is under way on six of the host venues for the football cup, with designs having been unveiled for two other venues. The zero-carbon emitting and climate-controlled stadiums are expected to top an investment of $4 billion (see separate article). Ahead of the World Cup and in line with the country’s 2030 Vision development plan, Qatar’s spending on infrastructure is expected to reach about $150 billion over the next decade, according to BMI (Business Monitor International) Research in its 2016 first quarter Infrastructure Report. Qatar has earmarked massive investment for transport infrastructure aimed at connecting the country to global trade networks and facilitating preparations for the World Cup, which the BMI said is acting as an important catalyst for growth. Some of the big-ticket transport projects in the pipeline include road schemes worth $20 billion, the $40-billion integrated railway development and an $8-billion deep-water seaport. The research firm expects around 77 per cent of all investment until 2017 to be directed towards transport and real estate as the country is expected to focus on the non-hydrocarbons sector. In the run-up to 2022, several major projects are expected to pick up, with the Public Works Authority’s (Ashghal) Expressway Programme and the $45-billion Lusail real estate development being among the largest projects under development. According to regional projects tracker Meed Projects, Qatar is set to award $22.2 billion worth of new contracts this year. This is about 24 per cent less than the $29.3 billion deals awarded in 2015, primarily due to lower oil prices but also thanks to a renewed focus on existing project delivery rather than the launch of new schemes. With more than $30 billion worth of projects either planned or under construction, Ashghal is a key stakeholder in the country’s future development, it stated. According to BMI Research, the residential and non-residential building sector will be a major driver of growth in Qatar’s construction industry over the long term. In addition, Qatar will need to expand its hospitality offering and boost capacity at its new Hamad International Airport. These developments, in turn, will mean that the utilities sector is in for expansion. According to the Qatar Electricity and Water Company (Kahramaa), the Qatari government plans to invest $22 billion in its power and water infrastructure up to 2020. All these developments will contribute to a strong real growth, which BMI expects to average 8.4 per cent between 2015 and 2019. On the downside, the cost of building materials may rise by as much as 15 to 20 per cent annually from 2018, according to some estimates. This, alongside rising labour costs, which rose by 4.5 per cent in 2015 according to management consultancy the Hay Group, could put further pressure on the profitability of projects in Qatar and increase the risk of delays. In order to mitigate these risks, Qatar is actively seeking to address logistical shortcomings in order to reduce shortages of needed materials, says BMI Research. Among such measures, Qatar has created a single buying source to import materials into the country run by a government subsidiary, which will then sell on to the contractors. Doha Metro ... further tenders expected soon. Qatar has one of the busiest road markets in the GCC and plans to build 8,500 km of highways, 200 bridges and 30 tunnels over the next five years, according to Transport Minister Jassim bin Seif Ahmed Al Sulaiti. The projects include Ashghal’s Expressway Programme, which will connect the capital Doha to all the major cities and energy and industry centres (see separate article). A major project in this sector, the Bahrain-Qatar Causeway – commonly referred to as the Friendship Bridge – has been hit by a series of setbacks, including a redesign to include high-speed rail tracks, which has put a further damper on the project due to rising costs. In the rail sector, Qatar Rail has started preparations to sign a slew of new contracts for the country’s ambitious rail network and is likely to issue tenders shortly for facilities management of the Doha Metro and Lusail Tram, said a Peninsula report. The metro network is being built over two phases and will include four lines. 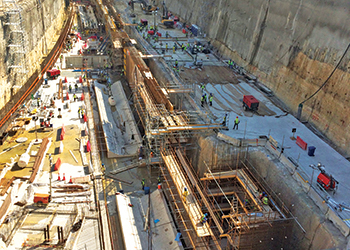 The first phase, which will cover 80 km across Doha – of which 63 km is underground – is expected to be completed in the fourth quarter of 2019. Qatar Rail said the work is progressing well on the first phase involving three lines – Red, Green and Gold. More than 60 km of tunnelling had already been completed out of the targeted 113 km powered by 21 tunnel boring machines (TBMs). The entire tunnelling work is targeted for completion this year, soon after which the MEP (mechanical, electrical and plumbing) contracts are expected to be awarded. The Qatari company has set an ambitious target of completing 50 per cent of the project work over the year. A total of 37 stations are under construction and the project has a workforce of more than 27,000 on site. Meanwhile, the Lusail Tram network, which extends 38 km and includes 37 stations, is due for completion in 2020. The tender for operation and maintenance of Doha Metro and Lusail Tram is due to be offered in the second quarter followed by another for maintenance and operation of the facilities associated with the long-distance rail, which will link all the GCC states. By 2030, all the three networks – Doha Metro, Lusail Tram and the long-distance rail – are expected to be completed and made part of a unified and integrated transport network covering different parts of Qatar. The recently opened Hamad International Airport is expected to be expanded, with the terminal to be doubled in size by 2020. Additionally, a new 45,000-sq-m passenger amenity area – with features such as a museum, spa, children’s play area, garden, library, gym, outdoor dining and lounges – is being planned for the northern part of the terminal. The planned expansion will increase the size of the passenger terminal to more than one million sq m, nearly double the number of contact gates to 61 and bring the number of remote gates to 14. The airport has been built on an area the size of Doha city, with half of this formed of reclaimed land. Five years on from being awarded the right to host the world’s most-watched sporting event, Qatar has initiated the construction work on six of at least eight venues that will be in used for the 2022 World Cup. 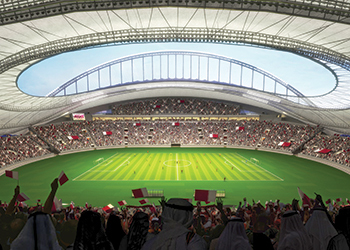 The first of these host venues – the 40,000-seater Khalifa International Stadium – is targeted for completion this year (see separate report). Investments worth $22 billion are expected to be made in Qatar’s power and water infrastructure up to 2020, according to Kahramaa. Projects include several new power stations and some 140 electricity substations. Key among such projects is the 2,400-MW Ras Laffan D, which is being developed as an independent water and power project (IWPP) and is expected to be operational in 2019. Kahramaa is also building a power and water plant in Umm Al Houl, the first phase of which is scheduled to be completed next year. In line with the global drive towards sustainability, Qatar has set a target to produce 1,800 MW of solar energy by 2020. Towards this goal, the nation’s first major solar power station in Duhail is scheduled to be operational in the next two years, producing 15 MW of energy. It is the first of a number of sites which will meet Qatar’s target. Meanwhile, Kahramaa and Qatar Petroleum have recently set up a new solar power joint venture to build around 1,000 MW of solar power generating capacity to diversify Qatar’s energy mix away from hydrocarbons. In the water sector, the headlining project is the Mega Reservoirs project, which entails the construction of five potable water mega reservoirs sites and an interconnecting network of large-diameter water pipelines. Every reservoirs site will ultimately comprise up to nine reservoirs, each of which will be the largest of their type in the world. The first phase of the project, which is currently under implementation following the award of five packages last April, will deliver a storage capacity of about 2,300 million gallons of water in 24 huge concrete reservoirs and comprise some 480 km of buried ductile iron pipelines with diameter up to 1.6 m.
The second stage, which will be implemented after 2020, will include construction of additional pipelines and 16 new reservoirs within the five mega sites to achieve an ultimate total storage capacity of about 3,800 million gallons of water. Qatar’s residential and commercial construction segments are going to be among the clear long-term outperformers in the country’s construction sector. To accommodate the thousands of spectators expected to arrive during the 2022 Fifa World Cup, major hotel chains have expressed interest in opening new hospitality projects in the country. According to a report by Colliers International, a global leader in real estate advisory, the total number of hotel and apartment rooms in Qatar is expected to reach 23,000 by the end of this year from the current 18,100 – meaning close to 5,000 rooms will be completed this year including some which were due to open last year. The ongoing Msheireb Downtown Doha regeneration project is expected to add 655 keys in 2016. Qatar has a pipeline of more than 14,000 keys under construction, according to Viability, a Dubai-based hospitality and property consultancy. Hilton alone is planning eight future properties, which will include the region’s first property under its Curio lifestyle brand, at the Mall of Qatar. Katara has six pipeline properties totalling 1,645 keys, including the 614-key ‘Iconic Towers’ project, in which the crossed swords of the country’s seal will be architecturally translated into twin arched towers. India-based Oberoi Group is also planning two new luxury properties – a 250-key luxury hotel in the West Bay area of Doha and a 148-key luxury serviced apartment in Lusail – construction work on which is expected to start this year for completion in 2018. Among other chains, AccorHotels has inked a deal with Al Jassim Group to operate the first Majlis Grand Mercure hotel in Doha. The new upscale property will be AccorHotels’ seventh hotel in Qatar, and is expected to be completed by mid-2018. Majlis Grand Mercure Doha will have a total of 283 keys, consisting of 223 rooms and 60 serviced apartments. Another major hotel planned is the Langham Place Hotel in Lusail City, which is scheduled to open in 2018. Meanwhile, Doha saw the opening of the five-star City Centre Rotana Doha early this year. The 52-storey tower at the City Centre Doha complex features 287 luxurious modern rooms and suites and 94 serviced apartments as well as state-of-the-art meetings and banqueting facilities, and restaurants. In addition, the country’s retail offering is also set to soar substantially. Qatar is set to see its largest leisure, entertainment and shopping complex – Mall of Qatar – open this year. Being built at cost of QR5.4 billion ($1.48 billion), the mall spans 550,000 sq m, and aims to attract a footfall of 20 million customers annually (see Regional News). Doha Festival City has announced that it will open its retail mall in September. Construction is under way on the second phase, involving a retail mall with over 240,000 sq m of gross leasable area. A five-star hotel with a convention centre will be developed as a third phase. Among other retail projects, Qatar-based Aamal Company has announced the start of work on the second phase of the City Centre Doha redevelopment project in Doha. The QR300 million ($82.3 million) revamp of the mall is intended to improve the current leasable area in certain sections. The second phase will be conducted in three stages and is scheduled to be completed by end-2018. Meanwhile, the massive QR20-billion ($5.5 billion) Msheireb Downtown Doha project marked the opening of its first building – Qatar Academy Msheireb – last September The school has a 12,754-sq-m campus and can accommodate up to 450 pupils. The ambitious Downtown Doha project is reported to be running behind schedule but is expected to open in phases over the next few years. It aims to be the world’s first sustainable downtown regeneration project, designed to regenerate and preserve the historical heart of Doha. Other key developments include is the country’s labour city. Last November, Qatar officially opened the region’s largest labour accommodation facility, which officials say is capable of housing up to 100,000 workers. The $825-million Labour City, built over an area of 1,100 sq m at Musaismeer near the industrial zone, took three years to build, according to Qatar News Agency. The development is divided into two parts, the residential complexes and the entertainment and business district. The residential component contains 55 buildings with a capacity for 100,000 workers, places of worship, a medical clinic and parking lot for buses. The accommodation also includes green areas and a number of public telephone booths as well as wi-fi-equipped centres for residents. The entertainment and business district includes a commercial centre, a market with 200 shops, a cricket ground, a theatre capable of accommodating 17,000 people and four modern cinema halls.